Can You Hook Up Two OTA TV Antennas? OK – this post doesn’t really belong in the Computers blog – but it certainly fits here since it is “techie” compared to the gardening blog. So the question is – can you hook up two OTA TV Antennas? In a nutshell – YES! 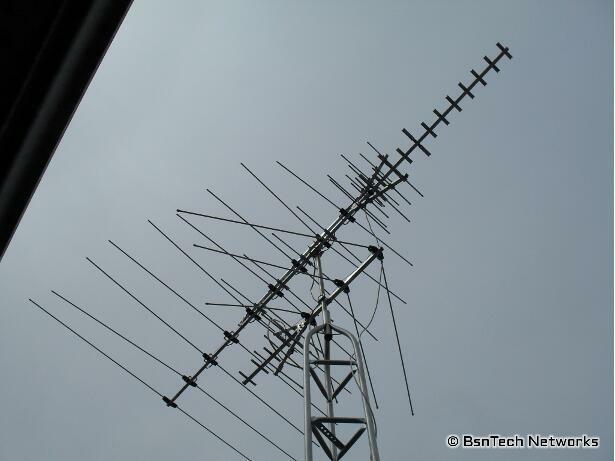 You certainly can combine two tv antennas to get a better signal. Why would you want to hook up two tv antennas? Well, let me explain. 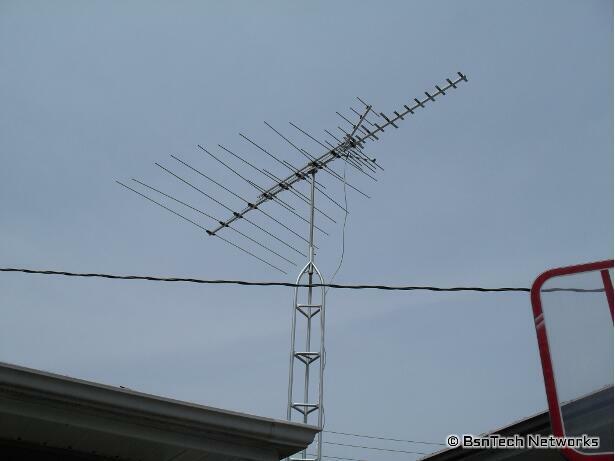 We had just a small little OTA TV antenna – maybe 2.5 feet long. Believe it or not, this antenna worked well to pick up the TV stations in our area. We have a couple of towers about 11 miles away from us to the east, a couple more about 45 miles away to the east, and another one or two over to the west of us by about 22 miles. OK – so do you see a dilemma here? The TV towers are to the east and west of us. Here is the funny thing. The station that is only 11 miles away from us – would cut in and out on our TV. But, the TV stations that were 20+ and 45 miles away came in just fine. Therefore, I went to buy a new antenna. I got one that said it would work for up to 100 miles away. The box was about five feet long. Boy was the looks of that box misleading! I got it home and found three different sections that were all about five foot each. The whole thing took about an hour to put together – and it is three times larger than the previous one! It certainly doesn’t look very large about 20 feet up into the air, but it was a bear to get setup! Alright – now you see the “V” section that is headed towards the right side of the picture? That means that the TV stations you want to pick up are in that direction. That direction is East in my case – which would be the TV towers that are 11 miles and 45 miles away. 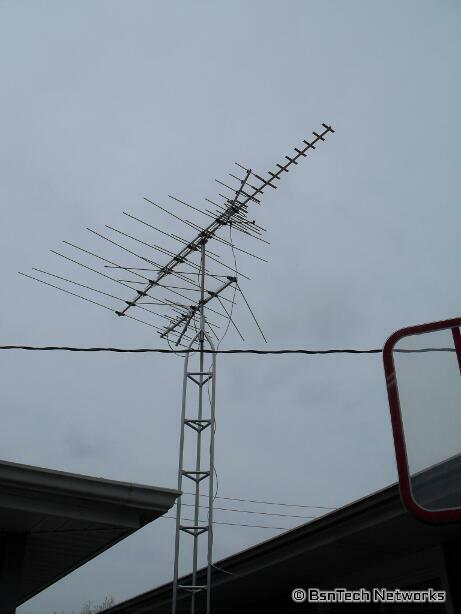 This was originally the way I had the old antenna – but yet the towers 11 miles away still would cut out. Interesting eh? So I went to re-scan for TV channels! Alas! We got maybe four more channels – although they were basically just repeats of other channels we had anyways. Now for the bad news. The TV stations that were to the west (would be to the left of the photo above) were cutting out! That was FOX and ABC. Can’t have that! So, my question is, is a larger OTA antenna better than a smaller one? Well, certainly – in my case – it must be! The smaller antenna was better than the larger one. Although the larger antenna DID fix the problem with the tv tower 11 miles away cutting out, now the stations 22 miles to the west (FOX and ABC) now are cutting out! So, I got to thinking – is there a way to combine two OTA antennas together? I looked online and found folks talking about hooking up two TV antennas and then combining them with a splitter – which then runs back into the house. However, many folks said that this would cause dual-pathing and other interference. Now, because everything is digital, I’m not really sure if that would matter anymore or not. I came up with another idea – why not connect both TV antennas together using a wire – and only one of them hooked to the coax! So, that is just what I did. I connected a 12-guage electrical wire (two wires) to the large antenna – and then connected it to the smaller antenna. Now, this is my configuration. You can definitely see the difference between the old TV antenna and the new one – it must be three times as big (or larger)!. 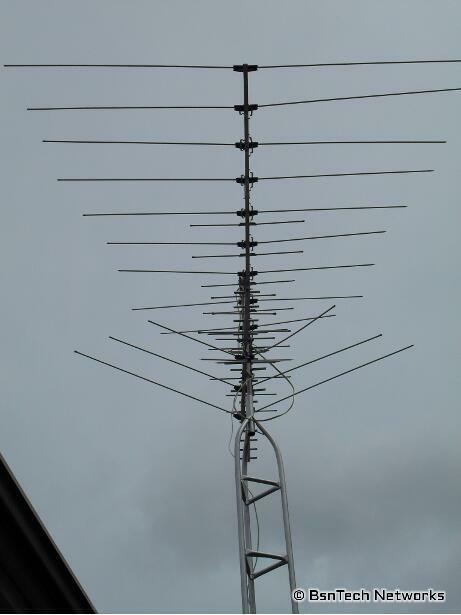 Notice the configuration – I have the “V” sections pointed in opposite directions; the largest antenna still pointing to the east – and the small one pointing to the west. The two antennas are maybe separated by two feet at the most. it is hard to see how I have them hooked together in the above photo. The wire you see on the right side is the coax cable – it is hooked to the largest antenna. Look at the difference in size between those! Alright – this is the back view (looking to the east). Do you see that wire that looks like is is looped a bit just above the TV tower on the right side? That is my 12-gauge, 2-wire electrical wire that connects the two antennas together. While it wasn’t exactly simple to hook up when you are on a tower, it is possible. Down to the TV I went! Guess what? Now, I get all the stations in without any problems! So, it goes to prove that you can hook up two OTA antennas together to get better reception! I almost had a notion to take the larger antenna back – because it simply is too big. It was $84 at a local garden/home store. They had a smaller variety that was $20 less. But, it just isn’t worth dismantling both antennas from the mast, taking apart the large one, returning it, then putting it all back up again. So overall, this did fix the issue with the TV cutting out on the station that is only 11 miles away – and we picked up about four more channels – but they are all repeats of each other. Rainy April is Gone – Now Where are the May Flowers? And I thought that I would be the only one that would do it like you did. I used a twin-antenna lead between the 2 antennas,but both antennas are pointing in the same directions for signal strength. I had a 13 1/2 foot UHF/VHF antenna and I cut the VHF part off and the total length is 54 inches now. The UHF part is the only part needed here in the US which is the V-shape . Also I had a smaller one that is now 36 inches long after I cut the VHF part off. With the left-over parts I cut off, I will make a third antenna and I will mount it in a different direction and I will wire it with a twin-antenna lead to the other antennas. I get 28 channels right now, but I have 3 TV and want to watch the channels without having to have to turn a rotor, so everyone in our house can watch there own programing. After cutting the VHF part off, the signal strength increased for each antenna and after I wired them together it went up more. The wind-load on the antennas also decreased. Hello guys, this thread is great. Just to make sure I am clear on connection points using 12-2 romex: is one end of romex connected where you normally hook the antenna wire, then the other end connected to the same location for the other antenna with an added matching transformer connected to that location to run coax to the tv? I may be asking this incorrectly but just wanted to know exactly where the joining points for the 2 antennas are with the romex. The wire is simply hooked up to the two twist connectors on both antennas. So there is the two twist connectors that the coax connector is attached to on both antennas – simply hook the wires to those. Brian S. thank you for the clarification. Wow-it does work. Thanks guys, we now pick up uhf and vhf local channels since our cable provider went bankrupt. While sitting in our computer room I hooked up an old multi directional fm antenna to an old uhf antenna. The fm picks up local NBC channels 7-1, 7-2 and 7-3 broadcasted on vhf while the uhf picks up CW, CBS and MPB along with their sub channels. Tvfool indicated the line of towers then I pointed the “frankentenna” in that direction and we have tv again and it was inside the house! Thanks again. Thanks for sharing your experiments. It’s amazing that it works fine for you:-). Bravo! It is not always the case since RF propagation is complex. The antenna size determines the reception gain, the width of reception angle, and the frequencies that it will resonate and pick up best. A longer antenna (more elements) surely has a stronger signal gain, but with narrower reception angle as the trade-off. The width of the antenna (the length of each element) determines the frequencies to be received. The longer elements are for lower frequency, the smaller/shorter ones for higher frequency. So bigger is not always better. It depend on what you need. An UHF antenna is normally quite small. BR. I’m having the same problems. I’m not a highly evolved tech person so could you take some close up pics on how you connected them then how to the co-axial? Where do you connect the 12 Gage wires? is there a specific location on the Antennas that will work or does it work no-matter where the connection is? On each antenna, there are the two screws that hold on the coax cable connector. You will use those two screws to loop each of the two electrical wires around. Then, do the same thing on the other antenna. In GSM phones you initially had alot of problems due to signal cancelation (echo bounce) makeing the signal quality go from 100% to bad by moving the phone about 8cm (3inches). This problem was fixed by adding another antenna at proper distance making it “harder” to cancel out due to the collaboration of the antennas. Haveing two antennas makes it possible to catch more frequencies collectively as the two antennas probably have slightly different echoes. However placing the antennas at “incorrect” distance from eachother can cancel out signals completely for some frequencies. I didn’t think this would work, but I took two interior digital OTA antennas (pointing in opposite directions) and ran the coax from each antenna to a coax splitter then coax from there to my TV. I now get all available channels without the need to move the antenna around to pick up different channels. Signal strenth seemed to improve on all channels. This information was great as I have two towers one in Chicago the other in Rockford….thanks!! It would work better with 300 ohm flat lead in used . Instead of romex cable. I TRIED TO HOOK MY TWO ANTENNA’S TOGETHER, BUT EVERY TIME I DO MY VHF SIGNAL IS GONE. UHF IS GOOD AND I CAN GET ALL THE UHF CHANNELS IN BOTH DIRECTIONS THAT I CANT GET WITH ONE ANTENNA, BUT WHEN THEY ARE CONNECTED TOGETHER, THE VHF SIGNAL IS GONE AND I LOSE MY HIGH VHF CHANNELS. ONLY THE UHF WORK?